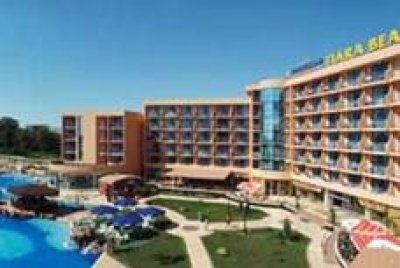 Location: The hotel is located just 100m from the beach and 800m from the resort centre with its many bars, restaurants and shops. Accommodation: Standard en suite twin rooms are air-conditioned with shower, hairdryer, telephone, satellite TV, mini bar and balcony. 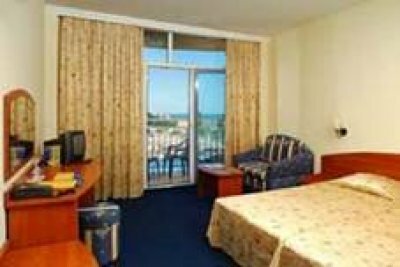 Seaview rooms, junior suites and suites are also available. Facilities: Lobby bar, safety deposit boxes, restaurant, internet facilities, hairdresser, wellness centre, indoor swimming pool, outdoor swimming pool with children’s section, fitness centre, sauna, massage, pool bar, sun terrace, sun loungers, parasols. This is a fantastic hotel. The rooms are a good size, and I found it good that there were mesh doors between the balcony and room, which kept the flies/mozzie's out while still allowing a lovely breeze in. The reception staff were a bit grumpy, but compliments to the chamber maids, they were very nice and left the rooms (there was a large group of us) in a very tidy state. The massage guy, Michael, was also very good. Generally, I think a lot of the staff working in the resort had 'tourist fatigue' by the end of the season!